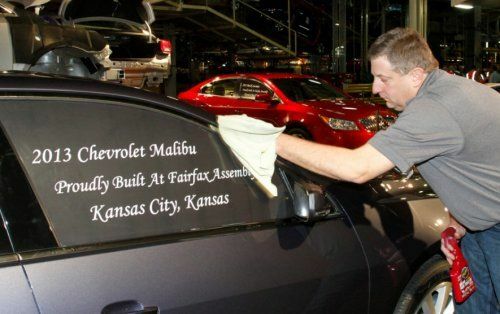 General Motors announced today that they will invest $600 million in their Fairfax Assembly and Stamping Plant where the popular Buick LaCrosse and Chevrolet Malibu are built – bringing the total moneys invested in the Kansas facility since 2003 up into the range of $2.5 billion dollars. The GM Fairfax Assembly and Stamping Plant currently covers roughly 3.2 million square feet and once the construction stemming from this $600 million investment is complete, Fairfax will have around 3.7 million square feet on which to build new vehicles. This construction will take roughly 2 years to complete and thanks to the nature of this construction, there will be no impact on production schedules so the 3,877 hourly and salaried employees at Fairfax wont have to deal with any down time during the building or upgrade processes. The most substantial portion of GM’s most recent $600 million investment is the addition of a new high tech paint shop facility that will have more of a positive impact on the environment than it does on the American automaker’s bottom line. Overall, the new paint shop at Fairfax will have a 20% smaller “footprint” on Mother Nature with somewhere in the area of 50% less energy used per vehicle produced at the plant. This includes new GM patented radiant tub ovens used for the paint curing process that will use 20% less natural gas and 40% less electricity than older ovens. Also, this new paint shop and the high tech tooling within will produce less harmful waste as a result of the painting process so while using less energy to do the job – less toxins are created during the painting and curing process. “This major investment is a vote of confidence in the employees and leadership of this plant and will allow them to continue producing beautiful, world-class vehicles like the Chevrolet Malibu and Buick LaCrosse – with the same quality workmanship that has defined the Fairfax complex for nearly 70 years,” said GM Chairman and CEO Dan Akerson. In addition to the new paint shop at the GM Fairfax Kansas facility, the onsite stamping facility will receive a new press that is more accurate so it creates less waste during the production process. This new stamping press is also expected to improve overall quality so when combined with the paint shop and the tooling upgrades that come as part of this $600 million investment – the vehicles built in Kansas will have less impact on the environment during the production process. The Buick LaCrosse and the Chevrolet Malibu that are currently built in the Fairfax Assembly and Stamping Plant are both very efficient thanks to their eAssist and Hybrid packages so now these two popular GM sedans will not only being environmentally friendly while being driven – they will be just as easy on Mother Nature before they are ever driven a mile. Fairfax built 283,213 vehicles in 2012 and with the growing popularity of these two models, the Kansas facility will likely only get busier in the coming years. Thanks to this massive investment, GM will be able to build all of these vehicles with less toxins released into the atmosphere. The decision to invest $600 million in the Fairfax Assembly and Stamping Plant is the latest in a long list of major investments in the Kansas plant made over the past ten years. In 2003, GM invested $722 million to build the 2004 Chevrolet Malibu while another $651 million went into the facility in 2006 to build the Saturn Aura. 2007 brought $208 million more for the 2007 Chevrolet Malibu and in 2009, the company poured another $158 million into Fairfax to prepare for the Buick LaCrosse. In 2010, GM invested $136 million to build the latest Malibu while $20 million was invested in 2011 to equip the Buick LaCrosse with the eAssist technology. When you factor in the $600 million for the new paint shop and stamping machinery – GM has invested roughly $2,495,000,000 in the thriving Kansas plant since 2003.